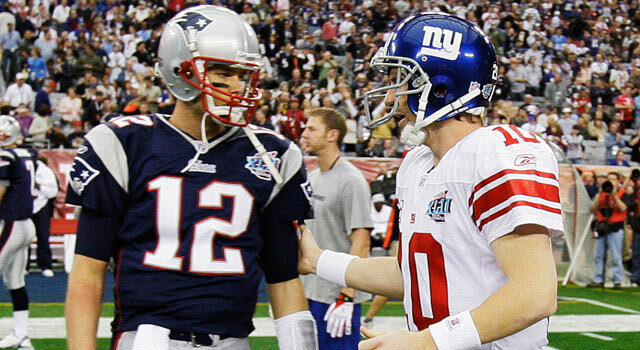 Published: Aug. 17, 2011 at 04:49 p.m.
You might remember that Eli Manning (right) helped the Giants upset Tom Brady's Patriots in Super Bowl XLII. Eli Manning believes he's in the same class as Tom Brady. Eli isn't even the best quarterback in his own family, ranking some place below Archie, Peyton, Cooper and Ma Manning -- though, according to scouting reports, she has quite a gun. On one hand, you want your quarterback to be confident in his abilities -- even if he's somewhat oblivious to the fact that he isn't in Brady's class. Seriously, does Eli not realize that throwing interceptions is a bad thing? The flip side is that you want your quarterback to be somewhat humble, maybe laugh off the selection and say, "Hey, that is for you fellas to decide. I do not get paid to make those judgments." And then there's me, who loves when Manning makes statements like this because it affords me the opportunity to churn out another Pick Six column, which -- judging by the comments section -- is something many of you look forward to every day. So here are six of the most outlandish things that Manning truly believes and make thinking he's in the same class as Brady pale in comparison. Everybody, it seemed, was either left confused or let down by the finale of "Lost." Not Eli, though. He thought the conclusion was lucid, poignant and totally knocked it out of the park. When news of the Miami Hurricanes football scandal broke, Eli was indignant about the whole thing, as he believed college football players actually go to school to get an education and that college football was more than a feeder to the pros. I know: Crazy, right? This probably should be higher on the list, because it's completely misguided. But what Eli should remember is that the NBA lockout is totally different from the NFL lockout. The biggest difference being that people actually care about the NFL. If you ever want a true test of a person, ask them which version of Van Halen they prefer. Anybody who prefers the Sammy Hagar years clearly isn't worth your time. In fact, I once broke up with a girl over this. Eli has played in New York for too long, but anybody who isn't on board with believing the Yankees are the most evil franchise in sports -- rivaled only by the Red Sox and Celtics -- truly is kidding themselves. Eli has a better chance of being better than Brady than thinking this is true. Even LeBron James couldn't agree with that sentiment. And with the way he fades in big games, you have to believe he's some sort of kindred spirit of the Manning family. Eli also believes that Adam Rank is talented. If you do, you can join the Rank Amateurs via Twitter or via Facebook. Be sure to catch the latest on the Dave Dameshek Football Program. "Six guys you should not impersonate..."